Looking for a unique way to cater your event? Why not try Hog Roast Bangor! What’s more is you can even go the extra mile if you really want to impress and hire one of our hog roasting machines to provide the most spectacular catering yourself! You may be feeling sceptical about your ability to fully cater an event by yourself but with our Hog Roast Bangor machine you will have all the help you could need. People are often impressed to learn that with our style of catering it really is just a case of letting the machine do its magic whilst you sit back and enjoy your event. 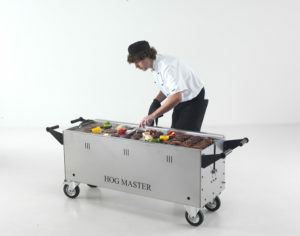 Carla contacted us looking to hire our Hogmaster machine for a family party. She explained that she had no prior catering experience and so was apprehensive about if she had made the right decision. We reassured her that with Hog Roast Bangor machines cooking has never been easier! As always, we invited Carla to visit us at our factory so she could see first-hand how the machines worked and so that we could give her a quick hog roasting crash course so that she would be confident on the day of the party. Carla was amazed at how quickly she picked up the hog roasting technique. Our Hog Roast Bangor team even gave her a couple of recipes to try out, all of which require minimal effort. With a hog roast machine once you have scored and seasoned the meat you are good to go, just keep an eye on the temperature and check the meat every couple of hours and in no time you will have cooked up the most delicious Hog Roast Bangor! Carla left our factory excited at the prospect of taking a Hog Roast Bangor machine home to try out herself! Hog Roast Holywood for A Surprise Father’s Day Feast!